President Obama’s recent visit to India was a step toward strengthening the bilateral relationship between the US and India. As US and India relations grow, Amira Nature Foods Ltd (ANFI) had the opportunity to interact with and educate US professionals and students in the field of agriculture and India’s rice industry, by showing them Amira’s state-of-the-art rice milling facilities. 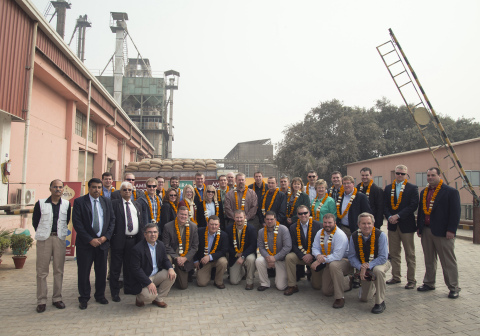 Thirty delegates from the University of Nebraska’s LEAD program traveled to India to tour Amira’s plant to learn about the operational process at Amira. The group, led by Dr. Terry Hejny, Director of the Nebraska LEAD Program, visited Amira’s advanced plant to understand the process behind running a global food products company. During the visit, the group interacted with various experts working at Amira’s plant to gain a better understanding of the manufacturing process and the latest technologies being utilized at the plant. Amira’s cutting-edge processing plant is the first to use fully integrated processing machinery in India. Amira operates with Swiss-made Buhler technologies. The technology is fully integrated and leaves the rice untouched by the human hand, allowing for greater quality control.